Barbeque is America’s National dish. It is, in fact, quite nearly a National cuisine. It offers a number of distinct main course dishes based on different cuts of different beasts featuring sharply differing sauces. The main course dish is accessorized with various vegetable and starch-based side dishes. There are significant and important regional differences in the food, representing many (if not most) of the regions of the country. Barbeque is not, however, hamburgers and hot dogs on a grill. No matter how many back yard parties are called “BBQs” that does not make a quickly grilled hamburger anything that can properly be described as “barbeque.” Trading the low-brow burgers and dogs for expensive steaks or gourmet sausages – or even duck breasts or foie gras – may make it delicious, may even make it better but it still does not make it barbeque. It is manifestly not a matter of expense. To be barbeque what it must be is this: low and slow. 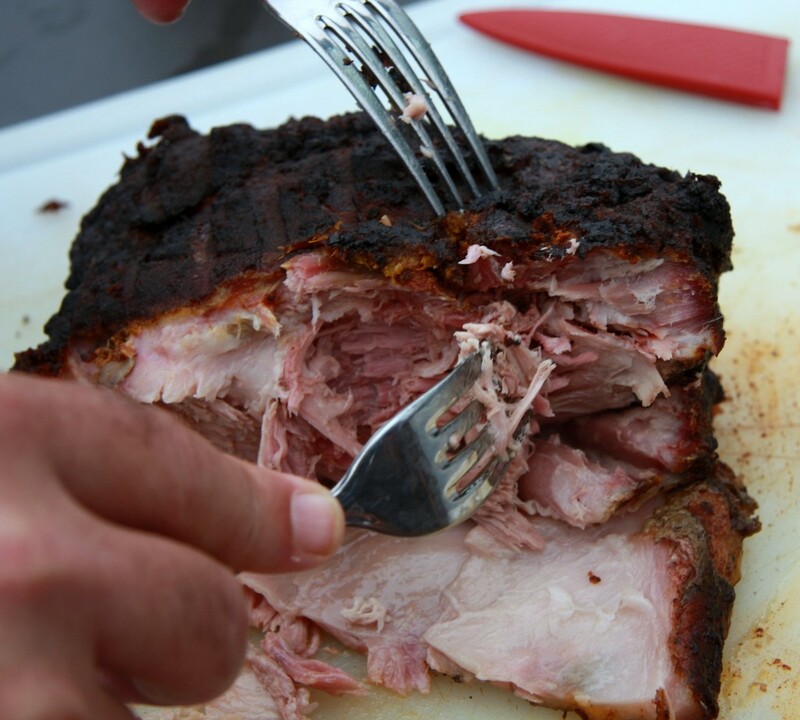 Whether it is beef brisket in Texas, pork ribs in Memphis or Kansas City’s pulled pork, the great commonality in nearly all barbeque is meats cooked for long periods of time at very low temperatures. The sauces vary greatly. The Carolinas offer sauces based on either yellow mustard or vinegar. Kansas City, Memphis and Texas offer completely different variations on tomato-based barbeque sauces, some sweeter, some more tangy, some more spicy. With the Kansas City Chiefs coming to town there was not much doubt what direction our tailgate fare would go: Kansas City Barbeque. 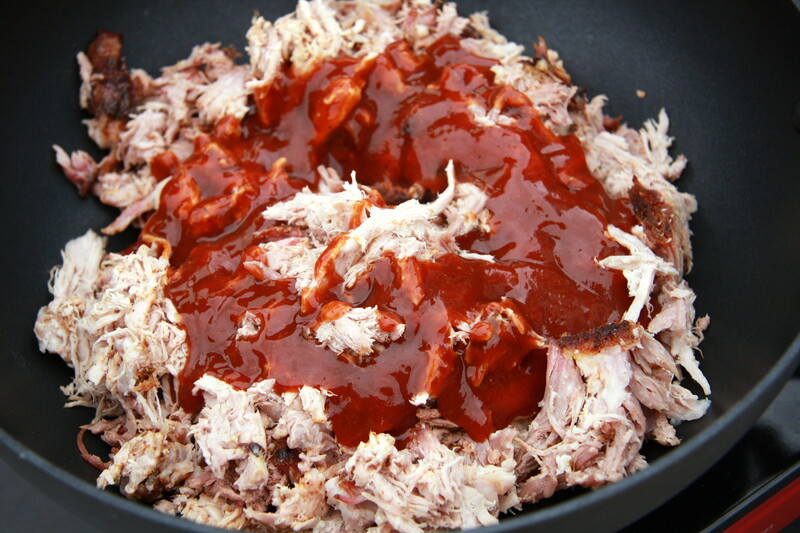 Kansas City’s brand of barbecue is pork smoked slowly over a variety of woods and then covered with a thick tomato and molasses based sauce. 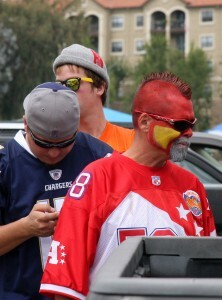 But this is San Diego. It is, quite clearly, not Kansas City. We need a little bit of heat with our sweet and tangy. Chipotle? That should do the trick. And the sweetness of the sauce and richness of the pork seemed to me to cry out for the acidity and crisp texture of some pickled onions. That, too, ought to do the trick. As much as our “innovations” might seem to be contrary to Kansas City’s BBQ tradition, it really is not entirely so. Arthur Bryant’s, one of Kansas City’s most famous Barbeque joints (located near the former Chief’s stadium) bases its products on a sauce that would seem to be quite contrary to that which is supposedly “traditional” in Kansas City. Arthur Bryant’s sauce features vinegar and paprika rather than tomato and molasses. So the addition of a different flavor element – or even a different flavor profile — to the traditional ones is hardly KC sacrilege. Is it high cuisine? No. Should we be expecting it on the menu at The French Laundry? Probably not. Of course, it occurred to me that with a few changes perhaps it could be. Maybe we could cook the pork sous vide. And we could spherify the barbeque sauce using sodium alginate and calcium chloride to gel and contain the liquid. And then we could finish it all off with an onion confit powderized with maltodextrin. Right? It would work perfectly at Alinea or WD50! But why? Just because its ours, why must it be worthless? There is a deep authenticity and charm – even a connection to who we are as a nation — in the traditional version cooked low and slow over smoky wood. So it was with that in mind that our attempt to eat Kansas City before our Chargers did the same was: Pulled Pork Sandwich with Pink Pickled Onions. 1. Make the Pink Pickled Onions. Place the onion slices in a metal bowl and cover with boiling water for one minute before draining. Place the remaining ingredients in a saucepan and bring to a boil. Add the sliced onions to the saucepan and let stand for two hours. Store a refrigerator. 2. Make the Spice Rub. In bowl, combine all the spice rub ingredients. Whisk, mix or process to fully combine. 3. Rub the Pork. Score diamond pattern on fatty side of pork. Insert knife into pork to create small pockets for each of the garlic slices. Insert a slice of garlic clove in each. Rub the pork all over with enough spice rub to cover the entire slab. Reserve the rest. Wrap pork with plastic; refrigerate overnight. 4. Smoke the Pork. Prepare a smoker (using apple wood chunks or chips) as required by your equipment such that it can maintain a heat of between 225 and 275 degrees, Fahrenheit. If using a Weber-style charcoal smoker, fill the water pool with one quart of apple juice. Remove plastic from pork; place fat side up, on the smoker and cook for 8 to 10 hours, until it is virtually falling apart when lifted. 5. Pull the Pork. Transfer pork to cutting board and allow to stand for at least five to ten minutes. Using two table forks, shred the slab of barbequed pork, by pulling at itin opposite directions. Place the curved base of the tined sections facing each other (away from the center of the slab) and, with your left hand pull to 9:00 while pulling to 3:00 with your right hand. Continue doing so until the entire slab of pork is “pulled” into moist slivers. 6. Make the Pulled Pork Sandwiches. Toast the rolls on a grill or pan. 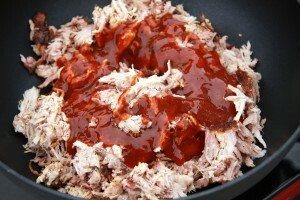 Meanwhile, place the pork in a sauté pan with just enough of the barbeque sauce to combine with and color the pork. 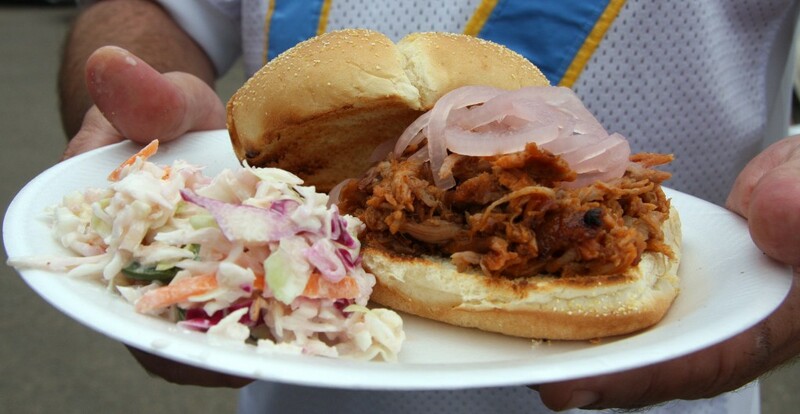 Pile a generous amount of the pulled pork on each roll and top with the pink pickled onions. Serve with a side dish such as cole slaw. Looks tasty! Love the idea of the pickled pork onions, too.